To purchase High Seas Raffle Tickets, you can use Paypal. We will send you the stubs from the tickets and keep the name portion for the drawing. Win a balcony cabin on the the High Seas Rally. It's the World's Only Biker Rally on a Cruise Ship. Ports of call include Grand Cayman, Cozumel, & Key West. This 2019 cruise is slated to be the last High Seas Rally. You don't want to miss this one. Tickets are $20 each and only 300 will be sold. Those are pretty good odds of winning. 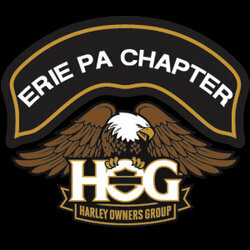 Proceeds benefit Injured Motorcycle Riders Foundation and Veterans Miracle Center of Erie. Approx. $200,000 in CASH and vendor prize winners. Check out the official HSR website for more information, photos & video. Transportation, hotel accommodations, are not included. Passport is required. Contact director@eriehog.com to purchase your raffle ticket.